There's this amazing manicure that I've been seeing around. 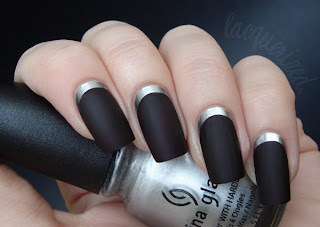 The Ruffian Inspired or reversed moon mani as it's called. Since I adore moon mani's (Dita von Teese, wow), I wanted to try it! Also, I promised the lovely ladies from the Dutch boards to do a full mani, so here it is! I've seen so many pretty ones already on the blogs, mine is a bit boring, but I like it nonetheless. It may look a bit better on shorter nails though, what do you think? The colors I've used are China Glaze Millennium and OPI - Lincoln Park After dark matte. Only one coat of each! I never use the matte because I was so disappointed when I found out how dark it was, it's nothing like the original shade! However I think it fits well in this manicure. I'm definitely going to do this again, but with other colors. I also wanted to show you a gift my best friend gave me today! He also got me 3 gorgeous nail polishes, but you'll see them making an appearance on my blog soon enough ;-). Look at this cute little monkey! I absolutely adore it. What (the hell) is it, you might ask? It's a nail polish dryer! When you put your hands on the banana button, the monkey will blow air at you. It's so damn cute, it makes me feel all fuzzy inside. If you're reading this: dank je wel!! This was it for today, dear readers! Take care and till next time.